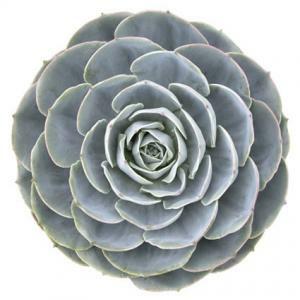 Echeverias are an enormous group of succulents from Central and South America. Known for their astonishing array of leaf color and form, they are an exquisite addition to cactus gardens, patio planters, and even indoor terrariums. These perennial plants are tiny, rarely growing more than a few inches tall and slowly expanding across the soil to form small patches. 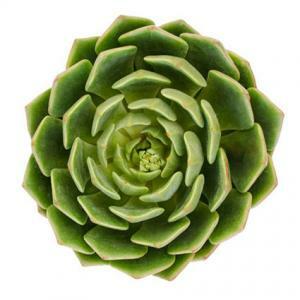 They come in a rosette shape and reproduce themselves by way of little offsets - miniature versions of the mother plant - that emerge on all sides. Tiny little blossoms appear in summer, which resemble asters. Their exotic form is best viewed close up, such as in a rock garden or planter. 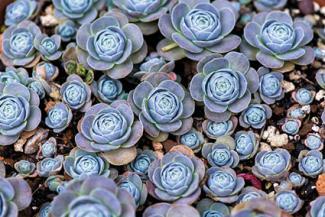 Echeverias tolerate light frosts, which have the effect of bringing out the color in their leaves, but will die in temperatures much below 30 degrees. They are easiest to grow in pots, an approach that allows you to bring them indoors for the winter. They tolerate full sun or part shade outdoors and are more than happy to spend the winter in a sunny window. Special care must be taken with their soil. They can be grown in a commercially prepared cactus mix, lightweight potting mix, or garden soil that has been mixed with a bit of sand or gravel - these are essentially desert plants. They do need some water, but the soil should be allowed to dry out completely between waterings. Fertilizer is not necessary. Echeverias have such particular growing requirements that if you're not gardening in an arid climate, it's easiest to grow them in a pot. 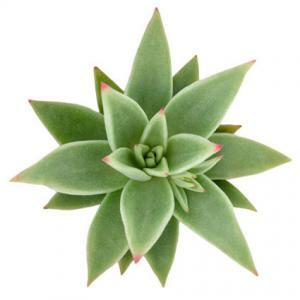 Combine them with other succulents or perennials that also like dry conditions, like euphorbias or even lavender and rosemary. 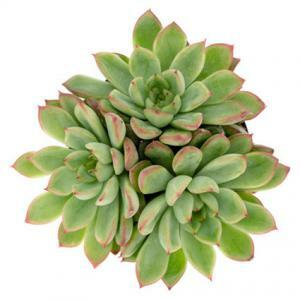 Avoid mixing with plants that have large, lush leaves or a sprawling growth habit - the echeveria will be quickly overtaken and shaded out. They are a great complement to cactus gardens, as they form a nice groundcover to contrast the upright growth habit of cacti and their colored leaves set off the deep green color typical of cactus plants. 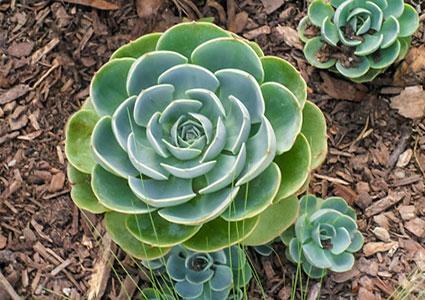 Place rocks strategically throughout the cactus garden and plant the echeveria so that it can ramble over and around them. Echeverias are wonderful in terrariums, but not the kind with a lid. 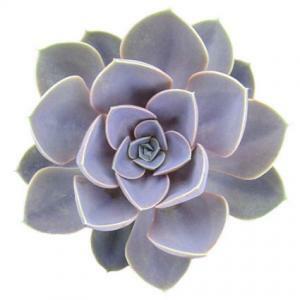 These hold moisture and humidity, which is lethal to echeverias. Instead, grow them in large glass globes, using colored sand to cover the surrounding soil. These are very low maintenance plants. Water lightly every few weeks and keep weeds away. A mulch of fine gravel or pebbles in a contrasting color to the variety being grown is great way to set off the color of the foliage and helps to prevent rot. The little offsets that continually form around the base of each larger rosette can be clipped off and planted nearby - they form roots on contact with the soil and are a convenient way to spread the plants over a larger area. 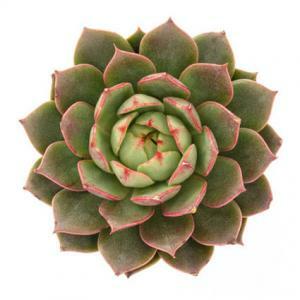 Other than rot caused by excess water, echeverias rarely suffer from pests and disease. The two exceptions are the sap-sucking insects, mealy bugs and aphids. If they get out of hand, treatment is straightforward using an insecticidal soap or neem oil, both of which are natural products. 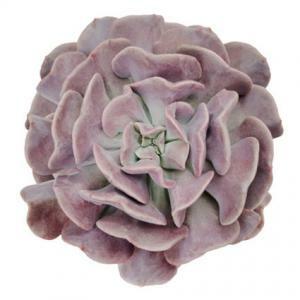 There are hundreds of varieties of echeveria available ranging from the cute to the bizarre. 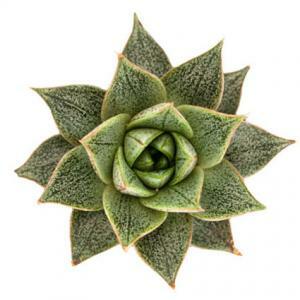 Echeveria agavoides resembles a miniature agave plant with red tips on the end of its green leaves. Blue Cloud has out of this world blue-tinted foliage. Huffs Pink has bluish foliage tinted with pink. Variegata has green leaves with cream colored stripes and a hint of pink. Echeverias have a truly otherworld presence. Though they are in the plant kingdom, their unusual foliage makes them appear as something from the imagination of an artist, rather than a living organism.